The analysis modes, Transient, AC, DC, Noise and Transfer Function can be setup to automatically repeat while varying some circuit parameter. Multi-step analyses are defined using the same 6 sweep modes used for the individual swept analyses in addition to snapshot mode. See Transient Snapshots for details of snapshots. The 6 modes are briefly described below. Note that Monte Carlo analysis is the subject of a whole chapter see Monte Carlo Analysis. Device. Steps the principal value of a device. E.g. the resistance of a resistor, voltage of a voltage source etc. The part reference of the device must be specified. Model parameter. Steps the value of a single model parameter. The name of the model and the parameter name must be specified. Temperature. Steps global circuit temperature. Parameter. Steps a parameter that may be referenced in an expression. Frequency. 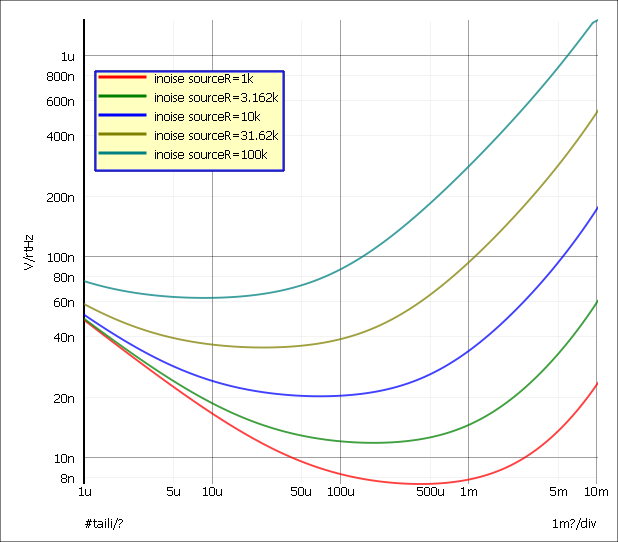 Steps global frequency for AC, Noise and Transfer Function analyses. Monte carlo. Repeats run a specified number of times with tolerances enabled. The simulator also offers an Octal sweep method but this is not supported by the Choose Analysis Dialog. Define Transient, AC, DC, Noise or Transfer Function as required then check Enable Multi-step and press Define... button. For transient/DC analysis you will see the following dialog box. Other analysis modes will be the same except that the frequency radio button will be enabled. Enter parameter as described below. Only the boxes for which entries are required will be enabled. In the above example, only the Number of steps box is enabled as this is all that is required for Monte Carlo mode. Choice of 6 modes as described above. Number of cores On multi-core computers, the work for multi-step analyses may be split between multiple cores to speed up the simulation. 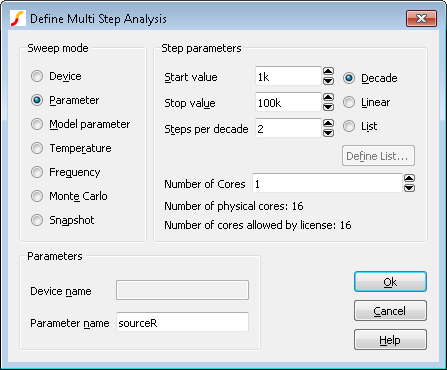 See Using Multiple Cores for Multi-step Analyses for more information. 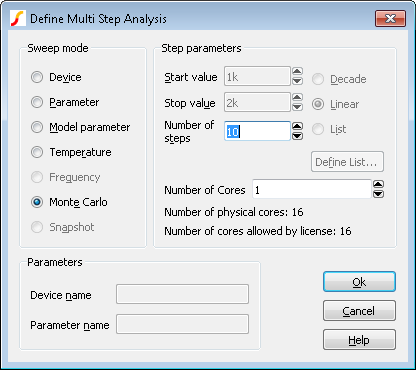 The work for multi-step analyses can be split between multiple processor cores to speed up the simulation. The maximum number cores that may be used is dependent on your license and on the number of processor cores that your system is equipped with. The speed improvement that can achieved by this method can vary due to a number of factors but is typically of the order of 75% of the core count. E.g. if you have 4 cores, the speedup may be about 3 fold. Set up a multi-step simulation in the normal way but set the Number of Cores edit box to the number of cores you wish to use. You will not be able to set the number of cores to larger than a certain value depending on your system and your license. These values are shown below the number of cores selector. The above shows the status box showing for a 1000 step Monte Carlo analysis using 8 cores. Each line shows the status for each of the 8 processes. Apart from sending back status information, each of the 8 processes runs completely independently and writes to its own data file. When the run is complete the data from each processes will be linked to the main data file. Subsequently you can plot and analyse the results in exactly the same way as you would a single core run. Fixed probes usually plot the simulation results incrementally, that is the plots are updated as the simulation proceeds. With Multi-core Multi-step runs, only the curves created by the primary process are plotted during the run. The remaining curves will be plotted automatically once the run is complete. With multiple processes running in parallel all writing data to a single disk, it is possible in some cases for a disk write bottleneck to develop whereby the simulation appears to hang temporarily. This problem is particularly acute with large circuits where a large number of signals are being saved. Each signal being saved is allocated a buffer in main memory and that buffer is written to disk when it is full. This works well if the buffers are large enough but with large circuits and many cores the buffers will be smaller and the time taken to write them out will become dominated by disk seek times. It is not easy to predict in a given situation whether the problem will arise. If you are running a medium to large circuit (over 2000 nodes) and are using 8 or more cores you should consider restricting the data saved. See Data Handling and Keeps. 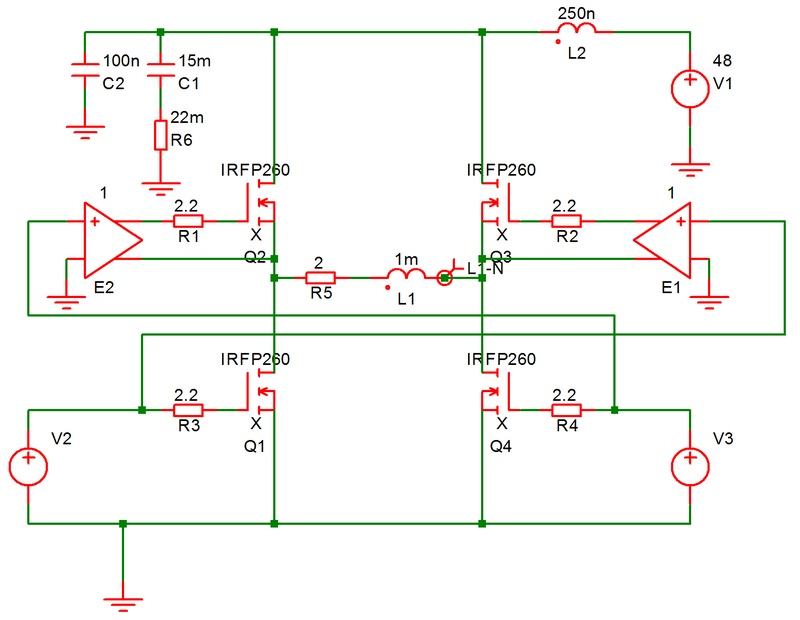 The following circuit is a simple model of a full bridge switching amplifier used to deliver a controlled current into an inductance. 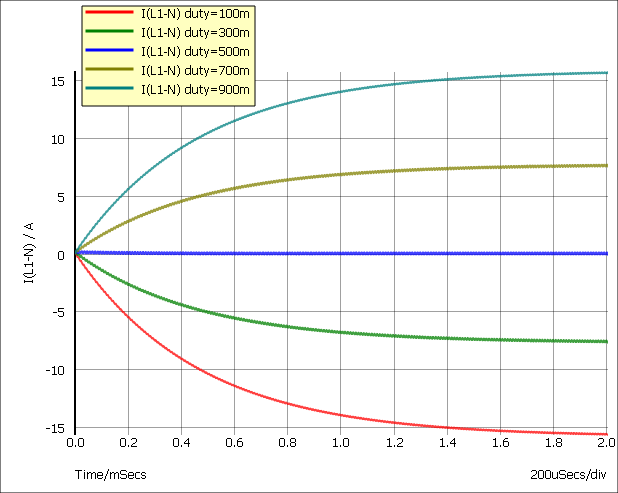 Sources V2 and V3 have been defined to be dependent on a parameter named duty which specifies the duty cycle of the switching waveform. See EXAMPLES/BRIDGE/BRIDGE.sxsch.